The apple juice diet for the liver refers to a liver detox, cleanse or flush, terms that are used interchangeably. Sometimes it is referred to as a gallstone flush. Apple juice is one of the key ingredients in some versions of a liver cleanse. Other versions rely more on olive oil or walnut oil. All of the apple juice diets for the cleansing of the liver share a common characteristic -- experts such as the Nemours Foundation say they don't work. There are two variations of the liver cleanse. The classic method, invented by herbalist Frank Roberts in the 1950s, stresses taking 1 ounce of virgin olive oil on an hourly basis and with an empty stomach. The second version makes extensive use of apple juice. One version advises you to drink lots of apple juice and eat only fruits and vegetables for two days. Then you drink 1 to 2 tablespoons of Epson salt with water, 1/2 cup of olive oil and some lemon juice. Another version asks you to drink fresh apple juice for three days, along with lots of raw salad and unprocessed fruit, followed by 4 tablespoons of Epsom salts mixed in four cups of water, followed by fresh grapefruit and lemon juice. 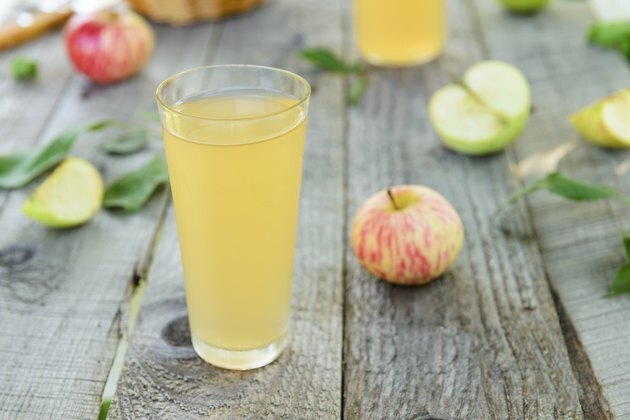 According to the Candida blog website, drinking lots of apple juice before cleansing your liver is recommended because the malic acid in apple juice is said to soften gallstones to enable them to be flushed from your liver and body. But as the Candida website states, there is no scientific evidence to support such a theory. Quackwatch.com demolishes the theory behind apple juice and liver cleansing. The apple juice liver cleanse apparently came from a letter to an editor of the distinguished medical journal "The Lancet," and extolled the value of a gallbladder flush used by the wife of the letter writer. As Dr. Stephen Barrett, the author of Quackwatch explains, "there is no way for apple juice or any other agent taken by mouth to come into contact with stones in the gallbladder or bile ducts." There is little evidence that liver cleanses or any other cleanse, detox or flush diet actually remove toxins from the body. Your body's organs -- kidneys, liver, digestive system and lymph system -- are designed to remove toxins from the body on their own and their function can not be improved without medical intervention, according to Debunking Detox. Most ingested toxins are filtered by the kidneys and then excreted in urine and stool. Detox diets may also cause unpleasant side effects You can suffer from dehydration, fatigue, dizziness and nausea. You should not consider a liver cleanse with apple juice or anything else without first discussing it with your health care provider. Quackwatch: The Truth About Gallbladder and Liver "Flushes"
emours Foundation: KidsHealth: Are Detox Diets Safe? What Foods Can I Eat When on the Lemon, Cayenne & Pepper Detox Diet? What Is in the Andreas Moritz Liver Cleanse Recipe? Are Eggs OK to Eat on a Yeast-Control Diet?